Muharram 2(October 5) Imam al-Husayn (a) entered Karbala. Muharram 3(October 6) ‘Umar b. Sa’d entered Karbala commanding an army of 4 thousand. Muharram 6(October 9) Habib b. Mazahir failed to convince the tribe of Banu Asad to help Imam al-Husayn (a). Muharram 7(October 10) Imam al-Husayn (a) was denied access to water. Muharram 9(October 12) The day of Tasu’a. Shimr b. Dhi l-Jawshan entered Karbala. Muharram 9(October 12) ‘Umar b. Sa’d wanted to launch the attack against Imam al-Husayn (a) but Imam al-Husayn asked for respite. Muharram 10(October 13) The day of ‘Ashura’. The event of ‘Ashura’ took place. Imam al-Husayn (a), his family and companions were martyred. 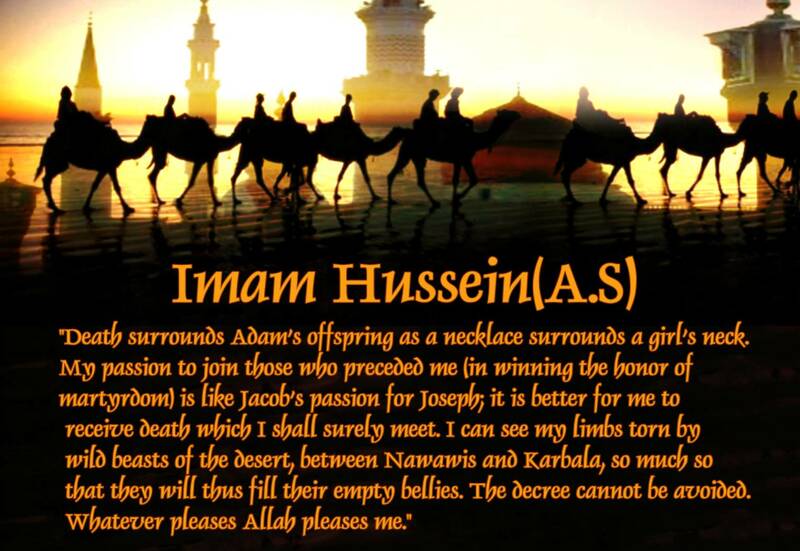 Muharram 11(October 14) Captives of Karbala (Imam al-Husayn’s (a) progeny) were moved toward Kufa. Muharram 11(October 14) Martyrs of Karbala were buried by Banu Asad. Safar 1(November 3) Imam al-Husayn’s (a) progeny and Imam al-Husayn’s (a) head entered Damascus. He was called ‘Muhammad-e-Azghar’ or Abdullah from Laila daughter of Masu’ud, son of Hanzala, son of Manath, son of Tameem. Son of the Second Imam Hassan, son of Ali. Both sons of Hur. Both from Kufa who joined the Holy Imam at Kerbala. Son of Omayya-al Abdi. From Basra son of Abi Obaida, whose father had been the companion of the Holy Prophet. The slave who was purchased and liberated by the Holy Imam- was the scribe engaged to write communications from the Holy Imam. From the famous ones among the faithful ones among the faithful devotees of the Holy Prophet. He was the follower of Muslim-bin-Aqeel in Kufa. Since Muslim was arrested, he hid himself until Husayn arrived in Kerbala, and submitted himself until Husayn arrived in Kerbala, and submitted himself to the Holy Imam. Along with his son-martyred at Kerbala- one of the greatest devotees of the Holy Imam. The liberated slave of Abi-Zar, joined the Second Holy Imam and thereafter he remained with Husayn and had come to Kerbala with Husayn. He was trained under Abi-Zar and was a very pious devotee of the Holy Imam. Of the tribe of Bani Tameem. One who was in Yazid’s army. Seeing the Devil’s forces decision to attack the Holy Imam, which he never thought would happen, left the ranks of the Devil’s forces and joined the Holy Imam. The liberated slave of hazrat Hamza, the uncle of the Holy Prophet-had come from Madina along with Husayn. A very brave nobleman of Arabia. He went into the armies of the Devil, and found his own uncle there. His uncle asked him “Have you come to kill your uncle?” He replied Yes! you are my uncle, no doubt, but God is my Lord and you have come here against him.” He killed his uncle. Along with him three others from the enemy’s ranks joined the Holy Imam. 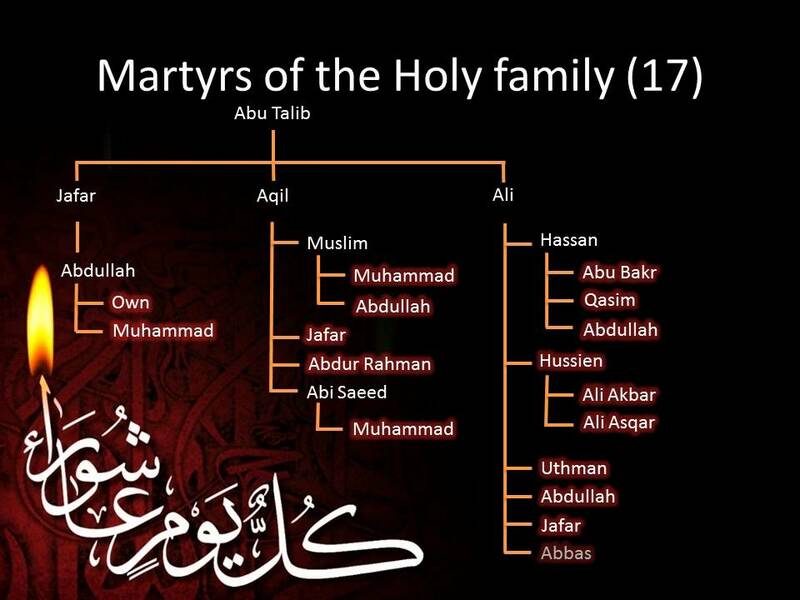 All were martyred. One who had already paid allegiance to the Holy Imam at the hands of Muslim, was martyred in Kufa. Habib left Kufa and joined the Holy Imam on his way to Kerbala. He was known as Habib ibne Mazahir bin Re’aab bin Al-Ashtar from the lineage of Asad Abdul Qasim Al-Asadi – aged 70 years. He was one of the faithful companions of the Holy Prophet, who after the Holy Prophet always remained with Ameerul-Momineen Ali and migrated toe Kufa when the Capital was shifted from Madina to Kufa, and accompanied Ali in all battles he fought against the rebels and traitors. His ideal faithfulness and sincere devotion to he Holy Imam has many glorious details. Of Basra from the tribe Bani Sa’d, famous nobleman in Kufa. He was the one who carried the communications of the Holy Imam to the pious ones of the devotees of the House of the Holy Prophet in Kufa. He was the son of Yazid ibne Najiyah bin Qa’nab bin Yitab bin Hur in the lineage of Al’Tarbo’ir Riyahi. A famous nobleman of Kufa, and experienced warrior specially selected by Ibne Ziad to command a contingent against Husayn. He was the one who obstructed Husayn’s way near Kufa, but he never believed that the venture of Ibne Ziad was to end in the martyrdom of the Holy Imam. When at Kerbala he found that the decision was to martyr the Holy Imam, Hur left the Devil’s forces and joined the Holy Imam, seeking pardon for his previous conduct. The Holy Imam received him with special grace. Hur was among the foremost martyrs in the way of God. He was the one who carried the message of exhortation from the Holy Imam to ibne Sa’d in Kerbala. Son of Areeb one of the faithful companions of the Holy Prophet. A very pious and brave noble personality enjoying the trust and the confidence of the people. 34. These twin brothers had come from Kufa employed in the forces of the Devil to fight Husayn. Later they left the ranks of the Devil’s forces and joined the Holy Imam and got martyred. A noble and very influential personality in Kufa uniquely brave. He was the gentleman who carried Muslim’s letter form Kufa to Husayn and remained with the Holy Imam until he was martyred. He was the man who, while the Holy Imam offered his prayers in the field of action (Kerbala) stood in front of the Holy Imam and received the arrows from the Devil’s forces, on his breast, and protecting the Imam in prayers. A cousin of Zohair al Qain. 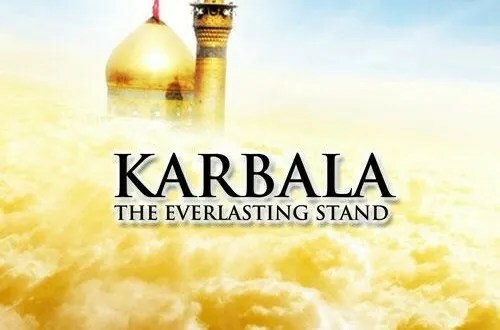 He went to Mecca with Zohair and when on his return form Mecca Zohair decided to join the Holy Imam, he accompanied him and got martyred at Kerbala. A man of very noble conduct and character endowed with strong will and prowess. A very pious personality fearing none but God. A truthful and a very reliable gentlemen. A staunch devotee of the Holy Imam. He carried Husayn’s letters to the devotees of the Ahlul-Bait in Basra. Ibne Ziad, the Devil’s governor of Basra caught him and this faithful servant of the Holy Imam became a martyr. A highly respected noble veteran of Iraq, travelled all the way to Kerbala to join the Holy Imam to get martyred with him. A noble, highly respected, God-fearing and a brave personality. He fought and fell seriously wounded, and was lying unconscious, the enemy thinking him dead had left him but when he returned to consciousness and heard the rejoicing of the Devil’s forces shouting that the Holy Imam had been killed, he got up, and fought, and was martyred. A lion-hearted, brave who was faithful to Muslim bin Aqeel in Kufa. After Muslim’s martyrdom, he joined the Holy Imam. This is the great son of the First Holy Imam Ali ibne Abi Taleb, from the noble lady Hazrat Ummul-Baeen, who was brought into this world to fulfill the desire of Amirul-Momineen to have his own representative, on his behalf to be martyred with Husayn in Kerbala. Abbas is well-known to the Muslim World for the unique divine qualities he was endowed with. This great lion-hearted son of the Lion of God in his qualities and position in Kerbala, is next only to the Holy Imam Husayn. The ‘Alam’ or the Banner which he held on behalf of the Holy Imam, was the Standard of Islam or the Truth, which is hoisted by the Shias, popularly during the mourning season of Muharram, and is revered as do the faithful subjects of good Kings as a token of their loyalty to him. The Banner being the Standard of Truth is only revered and respected and never worshipped as wrongly imagined and depicted by some ignorant ones. 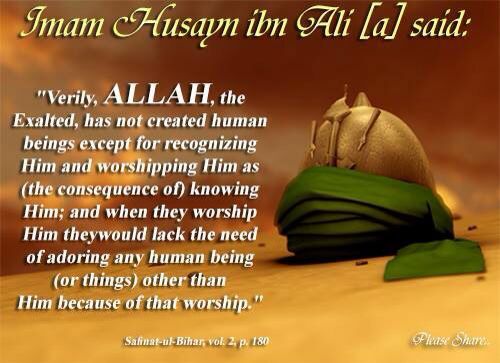 Worship in Islam is due to none but the One, the Only True God. 55. Abdullah bin Bushr Khash’ami tribe. A well known noble personality in Kufa. He came out of Kufa with ibne Sa’d but joined the Holy Imam. He had come to Kufa from Madina, and joined the Holy Imam. His wife also accompanied him to serve the Holy ladies. When Abdullah was martyred, his wife sitting at the dead body of her husband said “O Abdullah Thou hath entered Paradise, take me along with thee.” The good lady had not finished her lamentations when a slave of Shimar delivered a blow on her head with an axe and she was martyred. Came out of Kufa along with Ibne Sa’d but later joined the Holy Imam. One of the brothers of Hazrate Abbas, the third son of Ommul Baneen. Joined the Holy Imam on his way to Kerbala. Son of Zabiya at Taimi. Came out of Kufa with Ibne Sa’d but later joined the Holy Imam and was martyred. A very noble personality known for his piety in Kufa. A good reciter of the Holy Qu’ran and a very brave, God fearing, influential and powerful noble of Kufa. 84. One of the faithful companions of the Holy Prophet. An aged veteran who had earned a glorious name and fame for his valor and prowess in the expeditions against the infidels. On the night of Ashoora when the Holy Imam told his companions to find their own ways and save themselves from the wholescale massacre of his supporters which was in store for them the following day, Muslim addressing the Holy Imam said “O son of the Holy Prophet! Where am I to go before myself getting martyred here”? Muslim was one of the most prominent supporters of the Holy Imam in Kerbala, and was martyred there. A young son of Abdullah son of Hazrat Jafar-e-Tayyar, his mother was Khausa, daughter of Hafsa bin Rabi’a. He accompanied Qasim bin Hasan from Medina. One of the devotees of the Ahlul Bait in Kufa who escaped from the town at night and joined the Holy Imam at Kerbala. A companion of Ameerul-Momineen. Reciter of the Holy Qu’ran and Traditionalist. A noble personality known in Kufa for his piety, who escaped from Kufa and joined the Holy Imam in Kerbala. A great devotee of Holy Imam who always remained by the side of Abbas the Standard Bearer of Husayn. He could not bear the least disregard for the Holy Imam, from anyone in the Devil’s forces. A liberated slave of Amirul-Momineen (The Leader of the faithful). He was presented to the Holy Prophet by the King of Persia and the Holy Prophet presented him to Amirul-Momineen, who freed him. He came to Kerbala. Karbala is located 105 kilometers far from the southwest of the capital city of Baghdad on the desert shore of the western part of Furat. 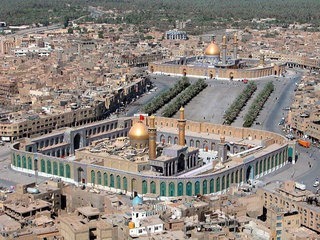 It was named as Karbala after the Waqiya e Karbala. Before that had happened, one of the names of the city was Taf, Al-Kirbah, which means softness, considering the softness of land. Nainawah, some also said the word is a Persian origin formed from two words which are, (Kaar) means work and (Bolo) means the higher, thus the meaning of the both words is (the higher work). i. Hafiz Ibn Katheer writes that one day, an angel came and sat down by the Prophet (PBUH). Our Prophet (PBUH) said to Umme Salma (the wife of the Prophet and the mothers of the believers), “We have a guest, do not let anyone enter as we are having a conversation.” In the meantime, Imam Hussain, who at the time was very young, entered the room, and as children do, Imam Hussain climbed on top of our Prophet’s shoulder. The angel said “Do you love him”; Our Prophet replied “Yes”. The angel then said “Your followers will at a later time martyr him. If you wish I can show you where he will be martyred”. Our Prophet (PBUH) said he would like to see where his grandson would be martyred. The angel then waved his hand and brought some red soil and said, “This is the place where he will be martyred”. Our Prophet took some soil from his hand and gave it to Umme Salma. She put the soil in a bottle. In 61 Hijri, after the martyrdom of Imam Hussain a.s, the people of Bani Asadis came forward and buried the holy corpse of Imam Hussain a.s and his companions. After its first construction bit by bit, all the graves had been rebuilt by the governing rulers. Al Muntasir, Sulaiman Al Qanuni, Syed Tabatabai and Shah Ismail Safawi were the contributors. And the last construction of all the tombs was done by Mid’hat Basha in 1914. With every glimpse, every mourner is feeling more close to the real peace. But if one will see the holy places of Karbala with insightful visions, they must be blessed with the eternal peace. The straight path or the right path is always the most difficult one to travel but one that rewards the most, and so we are told when young. This battle of good versus the evil is an age old phenomenon. The tragedy of Karbala took place some 49 years after the wisal of Prophet Mohammad [PBUH] in 61 Hijri (AD 680). The Muslim Caliphate briefly came to Imam Hasan (elder grandson of the Prophet [PBUH]) after the martydom of Ali bin Abi Talib (son-in-law of the Prophet [PBUH] and the Fourth Caliph of Islam). Sensing a possible split in the Muslim empire Hasan entered into a peace treaty with Amir Mu’awiyah, the son of Abu Sufyan and father of Yazid. All the first four Caliphs had first been acclaimed by the people of Medina but this right and duty had now been brushed aside in favour of the courtiers at Damascus. The solemn pledge to hold a ’shura’ was broken. None of the previous Caliphs had thought to impose their own sons on the community, and had looked beyond the narrow loyalties of a family, towards their brother in faith. When Mu’awiyah died, Yazid was acclaimed as the Caliph. It marked the decisive emergence of dynastic monarchy triumphing over the religion of God. The moment Yazid came to power he started demanding the oath of allegiance (bay’ah) from everyone using unfair means. Paying allegiance was an old Arab practice which was carried out in important matters such as that of rulership and authority. Those who were ruled, and specially the well known among them, would give their hand in allegiance, agreement and obedience to their king or the one in authority and in this way would show their whole-hearted support for his actions without any opposition to him. The approach of Yazid was proof enough of the kind of Muslim he was. He showed complete disregard for the tenets of Islam. Yazid’s message was delivered to Imam Husain as well but he said a firm no. Acknowledging Yazid’s authority by the Prophet’s [PBUH] grandson at this point would have meant confirmation of his evil deeds and Caliphate. For Yazid, Husain’s seal of approval was the one most needed. The Kufans urged Husain in Medina to ride north and lead them against the usurpation of the Islamic world by Yazid, and to reclaim his rightful place as the head of the Muslim nation. Husain, encouraged by the chief men of Medina, decided to respond and rode out of the oasis to assume the leadership of the true army of Islam. But not a soul left the garrison city to join him on the desert trail. The Kufans too would betray him! 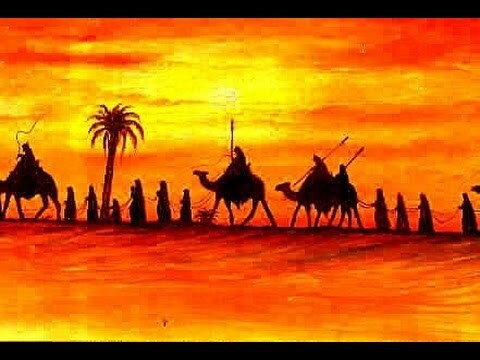 When Husain settled at a land devoid of water or vegetation named Karbala (‘Karb’ in Arabic means grief and ‘bala’ is for trials) he had just 72 loyal soldiers with him. 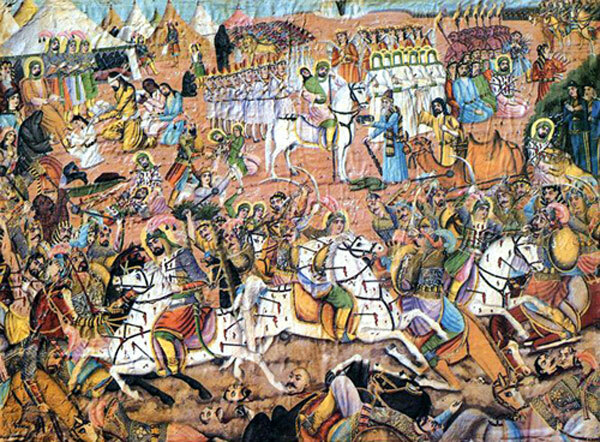 The battle of Karbala finds great similarity with the one at Badr – Islam’s first battle. It was the holy Prophet [PBUH] at Badr who fought with 313 die-hard supporters against a formidable army of some 1000 men. That day against all odds the small group won a decisive victory, and paved the way for a future Muslim empire. 56 years later it was his grandson with just 72 loyal men, who fought against an impossible opposition of several thousands to save Islam from the clutches of tyranny. Karbala was a battle of truth against falsehood, humanity against villainy, righteousness against evil, justice against corruption. The much loved grandson of the Prophet [PBUH] stood in the scorching heat of Karbala along with his companions, devoid of water but determined. His loved ones, including his six month old son, fell martyr one after the other. In spite of this he repeatedly invited the other party towards righteousness and forbade them from evil and immorality, but it all fell on deaf ears. When the time arrived for him to march ahead all alone, he did it in a fashion which was reminiscent of his illustrious father Ali. 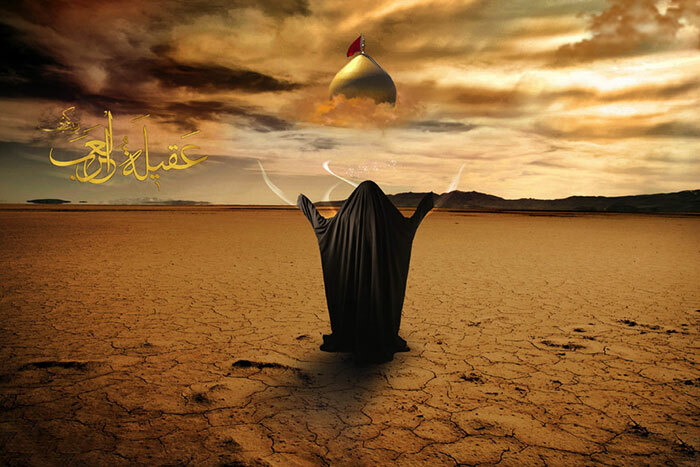 Husain fell in the desert of Karbala on that fateful Friday, the 10th of Moharram 61H. Worse was to follow. The bodies of the martyrs including the Imam were not only refused a proper burial but were trampled under the horses’ hooves and were left for the birds. The Kufan army looted the belongings of Husain. Imam’s family including his women-folk and tender children were humiliated and taken captives after burning down their camps. The women were paraded with uncovered heads. It wasn’t Islam! The severed heads of the martyrs including Husain were raised on spears. How Yazid played with Husain’s head and the emotions of Imam’s family is a well documented fact. Karbala to this day remains a heart-wrenching story of exemplary courage and bravery to uphold the real principles of Islam. Abdullah Yusuf Ali, the famous English translator of Qurán, has beautifully summed up the whole essence of this epic battle. There is of course the physical suffering in martyrdom, and all sorrow and suffering claim our sympathy, —- the dearest, purest, most outflowing sympathy that we can give. But there is a greater suffering than physical suffering. That is when a valiant soul seems to stand against the world; when the noblest motives are reviled and mocked; when truth seems to suffer an eclipse. It may even seem that the martyr has but to say a word of compliance, do a little deed of non-resistance; and much sorrow and suffering would be saved; and the insidious whisper comes: “Truth after all can never die.” That is perfectly true. Abstract truth can never die. It is independent of man’s cognition. But the whole battle is for man’s keeping hold of truth and righteousness. And that can only be done by the highest examples of man’s conduct – spiritual striving and suffering enduring firmness of faith and purpose, patience and courage where ordinary mortals would give in or be cowed down, the sacrifice of ordinary motives to supreme truth in scorn of consequence. The martyr bears witness, and the witness redeems what would otherwise be called failure. It so happened with Husain. For all were touched by the story of his martyrdom, and it gave the deathblow to the politics of Damascus and all it stood for. Karbala stands for courage, self-sacrifice, integrity, honesty, vision, and bravery beyond words. It symbolises all that is pure and true. Karbala teaches us that real battles are always fought in the minds and not on ground. Yazid was powerful and yet he lost the battle for truth. Also, being in the majority need not necessarily make you right. As the old adage goes, “Nothing lasts for ever.” Husain and his followers made sure that their martyrdom gave a fatal blow to Yazid’s oppressive rule. Karbala haunted Yazid till his eventual death two years later. It also teaches us to be patient and stand up against any form of wrong treatment. We curse Yazid and his army for their inhuman treatment of people, yet the cruel treatment of captives by the so called jihadis meets little protest. Muslims must recognize and protest against the savagery of inhuman treatment at all times, no matter who does it and where it takes place. The best homage that we can pay to the great tragedy is to do some soul-searching. Do we have the right to be called the followers of the Prophet [PBUH]? 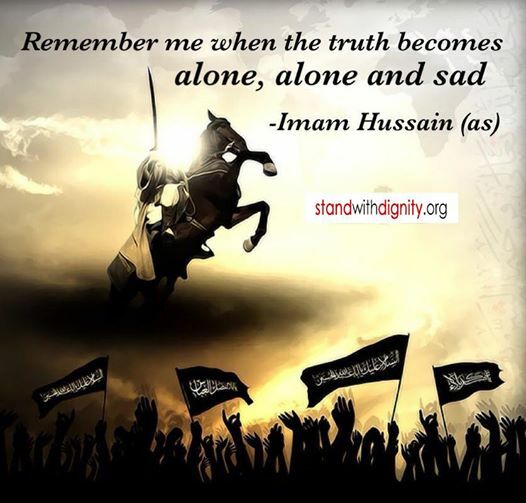 Have we really understood the message of Imam Husain? Are the tears for Husain drawn merely by the scenes of mere butchery? Would we ever stand up to the false narrations of the events at Karbala by some maulanas to generate excessive grief? 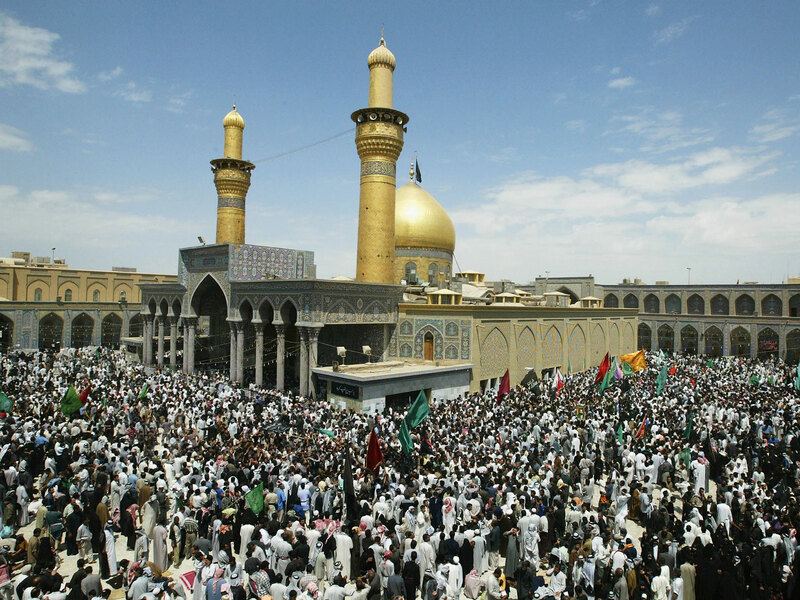 Was Karbala a political war or a struggle for true faith? Are we ready to shed aside our differences and respect each others’ view during our religious discourses during Moharram? And when we finally have all the answers then we would understand the real message of Karbala. Hum Zinda-o-Javed Ka Matam Nhi Karte.